Lots to report from the Minus Industries camp this month. It has been busy. The next Handmade Mafia event is going to be Saturday March 19 at the Strathcona Baptist Church (8318-104 Street) from 10am - 4pm. For more info on the event you can go HERE and for more info on the Handmade Mafia go HERE I will have some BRAND NEW items for sale. These are not to be missed! Minds will be blown! 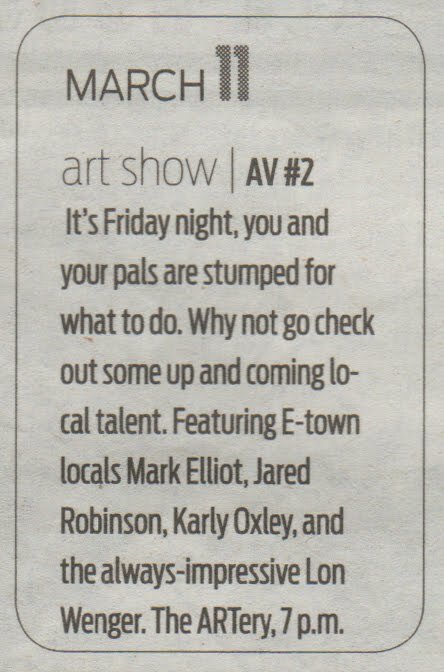 AND don't forget about the Art Show that I am in this Friday! 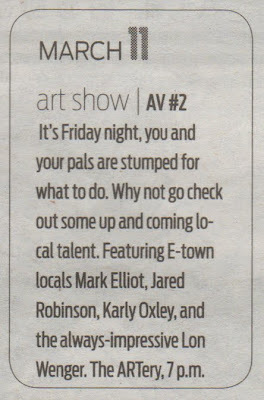 Check out the awesome plug it got in the See Magazine Events Calendar! Can you tell that the super awesome lovely beautiful talented gal at See who puts together the Calendar is also my Fiancee! YAY! I am so lucky! Now come to the show and buy my art so that we can have the best wedding ever!